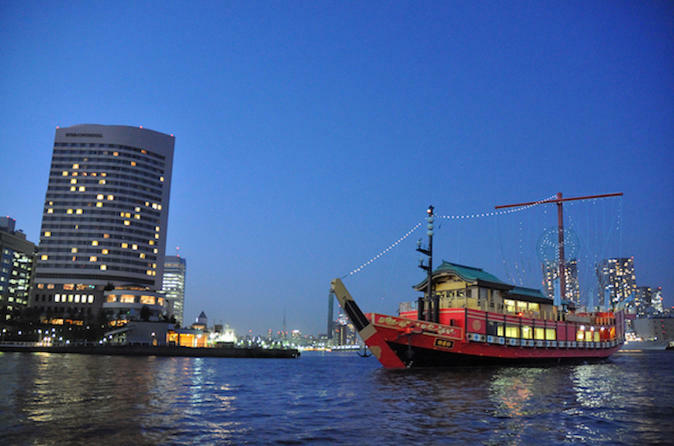 Indulge yourself in dinner and Oiran Show while enjoying the beautiful panoramic view of Tokyo on the popular Tokyo Bay Cruise! Enjoy the popular Oiran Show presented by one of the most popular and reputable companies in Japan. Be amazed by the colorful costume and stage design as well as the unique performance style that integrates various traditional Japanese art, such as kabuki and courtesan. Enjoy Dinner and Oiran show on the water! Go to the Hinode Port in Tokyo 10 mins before departure and ride on the uniquely designed cruiser and the boat will cruise Tokyo bay where you will see beautiful neon of the city from the water. During dinner enjoy the popular Oiran Show featuring Japanese traditional culture. Oiran Show is presented and performed by one of the most popular and reputable companies in Japan - Shiki (Four Seasons) Company. The performance is a blend of traditional Japanese dance, such as kabuki style and courtesan style and the performer will also invite audience to participate. The show was originally designed for both Japanese and international audience and everyone should be able to enjoy it regardless of nationalities and ages. The casts will also greet you as you board the ship, and work to make the occasion memorable by joining in toasts and taking photos with you during the cruise. In addition to the fantastic entertainment show, the cruise also serves a course dinner along with one drink.